editor's note: The views expressed in this newsletter do not necessarily reflect those of the Coastal Pirates Organization. You know, I have always felt that the Coastal Pirates have been one great fraternaty. Other than the time Russ broke #67's finger when he was playing for the Geriatrics, Pirates (whether they have been on the same team or not) have always lived by the unspoken code of respecting fellow Pirates ... Then again ... there was that Gucci-Glenn incident (they were on different teams then of course) ... and the Kevin-Evan incident, so maybe I had this all wrong. Maybe there isn't this unspoked code among Pirates ... Maybe its more like ”“The Code” in the NHL where oppenents can drop the gloves and fight during the game and then go out for dinner afterwards. (Unless of course your name in DiPietro, in which case your going to the emergency room to have your face reconstructed). So with all the said, maybe I should not have been surprised when there was a little scrum around The Hurt's net in Wednesday's game. From my angle on the bench it looked like Wildman crashed the net and swatted at the goalie just as the whistle blew. But then fellow Pirate alumni Bob Currao came crashing into the pile to deliver some “Goodsports Justice.” (Harris mentioned later that he always likes playing with Bob because he doesn't let anyone hit the goalie without “paying the price”). Wildman apparently was oblivious to what was happening because he was clearly unprepared when Bob grabbed him by the cage and gave him a few more then gentle pops. Even after it was over and he was asked about it on the bench, he could not explain what happened ... which ... for Wildman is a somewhat normal occurance. Anyway, even though Bob was sent to the box for 4:00 minutes for assaulting a Coastal Pirate, he was welcomed to the post-game “meeting.” Though I hear the S.O.C. is crafting a new fine to try and discourage this type of behavior from happening in the future. Attendance (players): Cassens, Gesior, Gucci, LeMatty, Matthews, McLaughlin, Miller, Newcomb, Nicolosi, Maccanico (sub). Net: Harris. Scoring: 1st period: 1-0 Hurt. 3rd period: 4-3 Pirates: Goals by Gucci (none); Gucci (Nicolosi); Maccanico (none); McLaughlin (none). 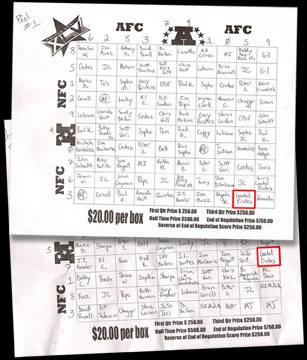 The promise of topshelf beer at all the post-game “meetings” was too much allure, so The Pirates bought two boxes in the GoodSports Super Bowl pools. Not only didn't we win, but we spent our entire Diet Coke™ fund on the gamble. Oh well. For the first 2 tallies of the night for the Pirates. Is this guy on a roll or what? For once again subbing for an MIA KennyG ... and keeping the scoring going.